NEW YORK CITY SummerStage is back, offering free outdoor performances in all five boroughs. This month, the Francesca Harper Project performs Harper’s Modo Fusion: Art Prototype, a foray into the world of beauty pageants that fuses dance with music and film in the East River Park, Aug. 16. In a series of theatrical vignettes, the work explores the exploitation of women and the way beauty pageants have evolved over time. The previous week, Aug. 9 & 10, Harlem Dance Caravan brings Illstyle & Peace Productions (a hip-hop based company), Camille A. Brown & Dancers, and Forces of Nature Dance Theatre to Marcus Garvey Park. www.cityparksfoundation.org/summerstage. Dominique Rosales of Francesca Harper Project. Photo by Lois Greenfield, Courtesy Summerstage. LONDON The Bolshoi, that purveyor of bravura, takes over the Royal Opera House for three weeks through Aug. 17. Its most buzzed-about ballerinas, namely Zakharova, Obraztsova, and “25 to Watch” Smirnova, appear in works like Balanchine’s Jewels, La Bayadère, and Swan Lake. It is hoped that director Sergei Filin will be able to join them (see “Dance Matters,” June). Natalia Osipova and Ivan Vasiliev make a one-night-only, megawatt guest-star turn in Ratmansky’s Flames of Paris, which has been sold out for months—a housewarming party of sorts for Osipova, who joins The Royal Ballet as a principal dancer for the upcoming season. www.roh.org.uk. Osipova in Flames of Paris. Photo by Elena Fetisova, Courtesy Bolshoi. MOUNT TREMPER, NY “This dance honors my past, present, and future family.” The enigmatic Souleymane Badolo shows his Buudou, BADOO, BADOLO, part ecstatic ritual, part seance, at the Mount Tremper Arts Festival on Aug. 3. (Buudou means “family” in Badolo’s mother tongue Gourounsi.) The natural wonder of Mount Tremper’s Catskill Mountains locale only adds to the work’s eeriness. www.mounttremperarts.org. Badolo in Buudou, BADOO, BADOLO. Photo by Ian Douglas, Courtesy Danspace. Rhythm World at Chicago’s American Rhythm Center with Lane Alexander, Derick K. Grant, and Chicago Human Rhythm Project, through Aug. 4. www.chicagotap.org. L.A. 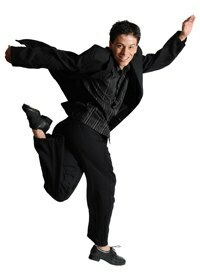 Tap Fest with Jason Samuels Smith and Chloe Arnold, Aug. 5–10. www.latapfest.com. Bay Area Tap Festival with Channing Cook Holmes and John Kloss. Aug. 13–18. www.stepology.com. Motor City Tap Fest with Gregg Russell, Claudia Rahardjanoto, and Sarah Reich, Aug. 15–17. www.motorcitytapfest.com. Tap United at the Collins Center for the Performing Arts in Andover, MA, with Aaron Tolson, Tap Attack, and Sean Fielder, Aug. 16. www.tapunited1.com. Jersey Tap Fest with Dormeshia Sumbry-Edwards and Jason Janas, Aug. 22–25. www.jerseytapfest.com. Santa Fe Tap Festival with Mark Mendonca and the D’Jeune D’Jeune African Drum and Dance Ensemble. Aug. 29–30. www.stepology.com. Vancouver International Tap Dance Festival with Dianne Walker, Jumaane Taylor, and Michelle Dorrance, Aug. 30–Sept. 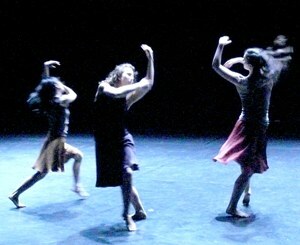 1. www.vantapdance.com. Charles Renato of Brazil jumps into Rhythm World in Chicago. Photo by Adilson Machado, Courtesy CHRP. NEW YORK CITY The Joyce is trying something new this summer. Gathering six small ballet companies from around the country, it is presenting a two-week sampler from Aug. 6–17. New Yorkers don’t often get to see BalletX from Philly, Dominic Walsh Dance Theater from Houston, Company C Contemporary Ballet from the Bay Area, or Whim W’Him from Seattle—though each group has a following in its hometown. Add to this intriguing roster two from NYC—Jessica Lang Dance and BalletCollective (a project of New York City Ballet’s Troy Schumacher)—and you have a mini festival that may lure you away from the beach. www.joyce.org. Domenico Luciano of Dominic Walsh Dance Theater in Matthew Bourne’s Swan Lake. Photo by Frank Atura, Courtesy DWDT. SAN FRANCISCO Eight dance groups—all with women at the helm—perform at San Francisco’s Summer Performance Festival, SPF6. The artists were recent participants in The Garage residency, under the auspices of SAFEhouse, a local incubator for emerging artists with a strong LGBTQ bent. Different movement styles and topics are tackled, from Aura Fischbeck Dance’s Have we all melted yet?, which explores assimilation, to BodiGram’s D.R.U.N.K.S, a satirical look at drinking culture (complete with drinking games). At the ODC Theater Aug. 14–18. www.spf6.org. The Milissa Payne Project’s Up in the Air. Photo by Lynn Fried, Courtesy SPF6. CHICAGO Where can you see Hubbard Street, Giordano, the Joffrey Ballet, Ensemble Español, Natya Dance Theatre, and Chicago Human Rhythm Project for free? Five times over? Chicago Dancing Festival, of course. These Windy City companies are joined by dancers from Ailey, Brian Brooks Moving Company, Philadanco, Juilliard, and Lar Lubovitch Dance Company (Lubovitch is a CDF co-founder). Performances take place at the Harris Theater, the Museum of Contemporary Art Chicago, and the Auditorium Theatre, with an outdoor finale at the vast Pritzker Pavilion of Millennium Park. Aug. 20–24. www.chicagodancingfestival.com. Krithika Rajagopalan of Natya Dance Theatre. Photo by Eileen Ryan, Courtesy CDF. VAIL The Vail International Dance Festival this summer, which celebrates its 25th year with a wealth of programs and events, has something for everyone. The anniversary benefit performance presents styles from tango to ballet, with Charles “Lil Buck” Riley (see cover story), Gabriel Missé, Tiler Peck and Robert Fairchild, and Herman Cornejo, among others. The festival continues to show its range in two evenings of international dance, a ballroom spectacular, and performances by dancers from popular TV shows. And Damian Woetzel, the festival’s mastermind, hosts an evening of premieres, including works by Paul Taylor, Larry Keigwin, and Fang-Yi Sheu. July 28–Aug. 10. www.vaildance.org. Kit McDaniel and Brandon Cournay of Keigwin + Company. Photo by Matthew Murphy, Courtesy VIDF. WASHINGTON, DC “The Ballets Russes changed the way people viewed dance.” So wrote Deborah Jowitt about the legendary company on the occasion of its centenary (see “Russes Revolution,” Feb. 2009). The burst of fauvist color, themes of eroticism, and blockbuster collaborations woke audiences up to the allure of ballet. Now on display at the National Gallery of Art’s Diaghilev and the Ballets Russes, 1909–1929: When Art Danced with Music in Washington, DC, are costumes, set designs, rare film footage, and drawings (by the likes of Bakst, Matisse, Picasso, and Chanel) from that ground-breaking period. Of special note is Natalia Goncharova’s cubist backdrop for Fokine’s glorious Firebird. Through Sept. 2. www.nga.gov. 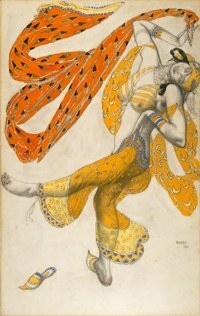 Léon Bakst’s costume design for an Odalisque from Schéhérazade, 1911. Photo from Collection of the McNay Art Museum, San Antonio, Gift of Robert L. B. Tobin, Courtesy NGA. NEW YORK CITY Transplanted Israeli choreographer Zvi Gotheiner takes an ancient Arab line dance for the basis of his dynamic work DABKE, which comes to Lincoln Center Out of Doors Aug. 3. With images of both protest and prayer, the dance unites Israeli and Arab traditions. ZviDance shares the evening with El Gusto, a group of both Jewish and Muslim musicians. (Maybe dancers and musicians can accomplish what Hillary Clinton could not.) 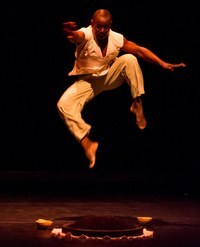 Other offerings in the series—which is free—include Kyle Abraham/Abraham.In.Motion on Aug. 1, and Dance Heginbotham on Aug. 8. www.lcoutofdoors.org. Gotheiner’s DABKE. Photo by Jacqueline Chambord, Courtesy Lincoln Center.